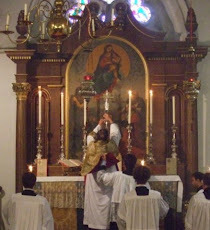 Fr Hunwicke's Mutual Enrichment: Chair of S Peter in January? I notice that the Calendar of the ICKSP retains the January Feast of Cathedra Petri. Can anybody throw light on this? I know that! What I wondered was: why did the ICKSP retain the January feast when it was removed from the (in my view, rather unfortunate) 1962 edition of the Roman Missal. Is it in a Calendar lawfully granted to the Institute? Could it be that this feast is just on their particular calendar, if they have one? Like their patronate. The Ordo published by the Vatican and prepared by the Ecclesia Dei Commission lists the Mass as a possible Votive Mass on this day. Why they retained it: surely because it is an ancient feast and an important Roman symbol of papal and magisterial continuity, and its abolition in 1960 by John XXIII was and still is considered questionable, as it was not in truth a 'secondary feast' of St Peter. (The 1960 cull of some feastdays made by John XXIII was on the grounds they were 'secondary feasts'). How they came to be allowed to retain it: I guess it might be due to their status as an Institute of Pontifical Right with the decretum laudis: they were and are dependent on the Vatican for every deviation from the norm, so presumably Rome must have agreed this liturgical variation, and since it celebrates the Holy See, that can't have seemed objectionable to Pope JP II.